In 1947, as the first cohort of KMT troops entered Formosa and began their looting and banditry, a group of Taiwanese intellectual, economic, political and social elites rose to resist the party’s ruthless and authoritarian way of governing Taiwan. Unfortunately, many sacrificed their lives in the resistance. Many were put to death around the February 28th of 1947. 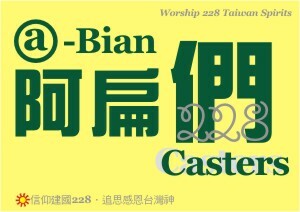 Since then, the day of February 28th took on a special meaning in the history of Taiwan. The Day defines the island’s national identity. East Asian scholars commonly call this event as February 28th Incident. Nevertheless, our Tati Foundation and the Holy Mountain, on the behalf of our beautiful Republic of Taiwan/Formosa, would like to sanctify the event as the February 28th Massacre. Our Predecessors died for an ideal. They gave up their most precious possession - their lives - for the most noble of all causes. They fought for freedom. In time, others followed. More elites fought for democracy throughout the past six decades. Many courageously resisted the authoritarian rules of Chiang Kei-shek, Chiang Ching-kuo, and the KMT regime during the White Terror Era. Directly and/or indirectly, many more bravely supported the pro-democracy demonstrations in the Formosa Incident and other social demonstrations up to the 2015 Northern Taiwan Anti-curriculum Changes Alliance youth occupation of the Education Ministry. These men and women dedicated their lives for a free, independent and democratic Taiwan. They, too, joined the divine rank of our Predecessors. In the process of their endeavors for a free and independent Republic of Taiwan/Formosa, our Predecessors figuratively and literally achieved divine status. Observe. Economic development and widespread prosperity during the latter half of the twentieth century, a propitious mid-nineties' transition to public participation in presidential elections, and Taiwan’s growing international reputation and proliferating contributions to the global community during the recent years are nothing short of divine miracles. Our freedom-fighting Predecessors’ celestial blessings are readily apparent. Their blessings had been, and will always be, with us. Hence, we call our great Predecessors the Taiwanese Martyred Spirits, both to celebrate their fight for our democracy and sovereignty and their attainment of the fruits of Bodhisattvas. The word “Bodhisattva” is defined as a person who has attained Enlightenment but stays with the public in order to help others attain Enlightenment as well - actions that demand tremendous sacrifice, moral courage and compassion. 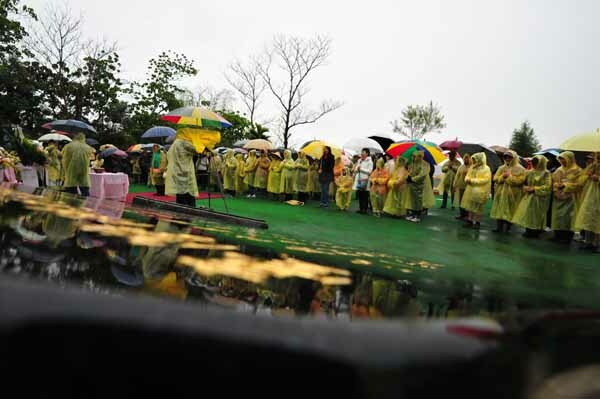 By peacefully fighting for freedom, the Taiwanese Martyred Spirits’ lives resemble those of Bodhisattvas’. The English mantra above is a romanization of Mandarin Chu-yin by the Wade-Giles system conversion table. Chanting of the Open Hearts Mantra is quite sublime, yet informal for personal chanting. Both audible and silent chanting can be done literally anywhere. Nevertheless, we recommend that chanting the Mantra out loud only in clean and chaste places – out of respect for Taiwanese Martyred Spirits and the Lord, Our Creator. Clean and chaste places include anywhere except bathroom and nuptial bedroom. Mantra pronunciations for both audible and silent chanting are absolutely critical. Please keep in mind that chanting this Mantra is to commune spiritually with Taiwanese Martyred Spirits. It also provides a linkage for our soul with Heaven. In short, the Mantra connects us spiritually to the celestial world. Therefore, it is highly important that the pronunciations be accurate. (1) An – IPA pronunciation key is /ɒn/ as in the “on” of “font.” This syllable is subsequently repeated once. (2) Hung – IPA pronunciation key is /hɔŋ/ as in the “h” of “home” combined with “ong” of “strong.” This syllable is subsequently repeated once. (3) Ts’an – IPA pronunciation key is /tsʌn/ as in combining the “t” and “s” of “that’s,” then join the “ts” sound with the “An” syllable. (8) Han – IPA pronunciation key is /hɒn/ as in the “h” sound of “home” combined with the “An” syllable. Listen to the Mantra with melody in this mp3 file here. For your references, a copy of IPA (International Phonetic Alphabet) pronunciation keys table can be found at this link: http://dictionary.reference.com/help/luna/IPA_pron_key.html.